TJ practices a high degree of craftsmanship and guarantees her products. If a hole develops in one of her thimbles she can repair it. If a needle threader wire breaks, she can replace it. If unexpected damage happens, she can probably restore the piece. There is no charge for repairs or replacements but $10 dollars is required for shipping to be replaced or repaired. For repairs sent from outside the USA, a credit card can be used to pay applicable shipping charges. TJ Lane learned metalworking at the University of Arizona in Tucson in the 1960s. TJ was a public school reading specialist before she began making jewelry full time. 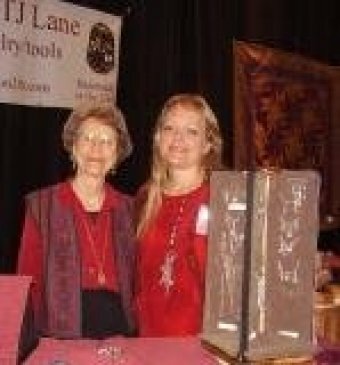 She taught silversmithing privately and at community college and wrote articles for Lapidary Journal and other magazines on silversmithing techniques. THIMBLES BY TJ LANE are made and finished entirely in the USA. Billanti Casting Company in New York makes molds from TJ's models and has been casting her thimbles and jewelry components since 1970. Finishing and setting gems is done in Fairfield, Iowa. There has never been a "brick and mortar" store front. Prices are based on precious metals market and are subject to change without notice.